Public debt more than doubled in the eight years of Obama’s presidency, rising from $6.3 trillion to $14.4 trillion. Gross federal debt – which includes the amount owed to Social Security and other government accounts – nearly, but did not quite, double. Trump held a press conference Feb. 15 at the White House to declare a national emergency at the southern border. After his remarks, Trump took questions from reporters, including one about his plan to combat the growing national debt. Trump said economic “growth will straighten it out” and criticized Obama’s management of the debt. “When I took over, we had one man that put on more debt than every other president combined,” he said. The national debt can be divided into two parts – the amount owed to the public, including private citizens, foreign governments and international investors, and what’s known as intragovernmental holdings, the amount owed to the Social Security Trust Fund and other government accounts. While the national debt has been increasing for decades due to near-annual budget deficits, it grew dramatically under Obama, increasing from $10.6 trillion in January 2009 to $19.9 trillion in January 2017, according to Treasury Department figures. This is the largest dollar increase under any one president by a considerable margin, but not quite as large as the debt Obama inherited. The U.S. added $9.3 trillion over his eight years in office, $1.3 trillion short of doubling. Under President George W. Bush, the debt rose by just under $5 trillion – the second-largest increase of any president. The public debt, which accounts for nearly three-quarters of the national debt, did double under Obama, increasing from $6.3 trillion to $14.4 trillion. When asked for comment, the White House did not specify what measure of debt Trump was citing, but economists often speak of public, as opposed to total, debt. “We and other economists tend to prefer ‘debt held by the public,’ which excludes debts the government owes to itself,” Patrick Newton, a spokesperson for the Committee for a Responsible Federal Budget (CRFB), told The Daily Caller News Foundation in an email. What caused the national debt to balloon under Obama? Besides wartime spending in Iraq and Afghanistan, the Great Recession took a major toll. As tax revenues declined and federal spending rose on safety-net programs like unemployment insurance and food stamps, the deficit regularly topped $1 trillion a year. Obama signed into law the American Recovery and Reinvestment Act, a financial stimulus package that increased the deficit by $827 billion between 2009 and 2014 through a combination of tax cuts and federal spending, according to the Congressional Budget Office (CBO). Bush-era tax cuts, extended and then made largely permanent under Obama, also contributed to the debt. The Budget Control Act, on the other hand, reigned in deficit spending. Newton said that Congress shares responsibility for the debt incurred under Obama. “It’s unfair to attribute the increase entirely to Obama. It’s Congress that writes tax and spending laws. The President has little power on their own to affect the debt,” he told TheDCNF in an email. He pointed out that the debt was already projected to increase before Obama assumed office. Robert Bixby, executive director of the Concord Coalition, a group that advocates for fiscal responsibility, made the same point, citing federal spending on baby boomers as one example. “During Obama’s first term, the baby boomer generation begin[s] to qualify for full Social Security benefits and Medicare at age 65. Spending on these programs went up as more beneficiaries began to qualify for benefits,” he told TheDCNF in an email. 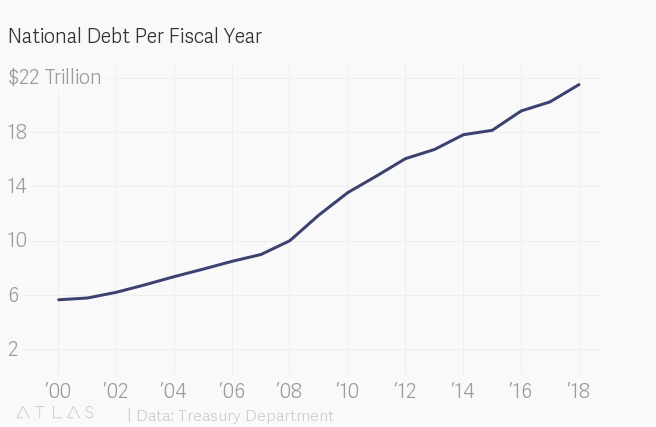 While Trump has been critical of Obama’s management of the debt, it has continued to grow rapidly under his watch. In Trump’s first two years in office, the debt has grown from $19.9 trillion to $22 trillion. The CBO projects that the debt will grow to $23.5 trillion by 2020 and will exceed $30 trillion by 2026. The CRFB warns that if the debt continues to rise, the U.S. will be at risk of a fiscal crisis and may be forced to make significant tax hikes and spending cuts. Director of National Intelligence Dan Coats issued a similar warning last year while testifying in front of the Senate Intelligence Committee. “This situation is unsustainable as I think we all know, and represents a dire threat to our economic and national security,” he said.